If you've ever wanted to know how to make bath scrubs, this is the project for you. 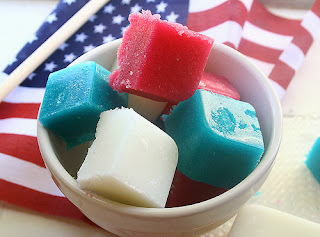 Combine glycerin soap, white sugar and delicious fragrances to create your own Patriotic Bath Scrubs. NOTE: These ingredients will be split into three batches: one red, one white and one blue. Melt 2 oz. of clear soap in the microwave using your 2-cup glass measuring cup. This should take about 30 seconds. Mix 2 oz. of your oil with the melted soap and stir until blended. The mix should still be liquid at this point. If it starts to thicken pop back in the microwave for a few seconds until your soap/oil mix is liquid. Add color, pinkberry sherbet lab color to your liking and mix thoroughly. For this project I diluted the 10ml bottle of lab color in 2 oz. of water and used 4 drops. (skip this step for the white scrubs). Add 20 drops of fragrance oil and mix thoroughly. Add 6 oz. of the sugar and stir rigorously until completely blended. Pour or spoon into you mold cavities. You should have a thick yet pourable mixture at this point. If it is too thick to spoon or pour into your mold you may heat for a few seconds in the microwave, but don’t heat it for too long as the sugar will begin to dissolve. Each color will make enough to fill 2 of the 4 cavities of the mold. Let harden to room temp and pop out of the mold! Note you may have to pat down the mixture with your fingers as it may thicken quickly. Repeat steps one through six for your blue and white scrubs, making sure to use the white glycerin soap for the white scrubs. After you have all of the scrubs unmolded, cut them into quarters using a knife or soap cutter. Store in an airtight container such as a wide mouth jar until you are ready to use them. The glycerin soap in the recipe makes for a creamy emulsified scrub when mixed with water. To use, just take one scrub into the shower, knead with a little water in the palm of your hand and scrub over your skin! These will stay fresh for 3 months and be sure to keep them away from moisture so they don’t melt. Enjoy!